Why make a Graduation plan? Many students struggle with deciding what to take each semester. It is not uncommon for students to simply pick a few GE courses, a few fun courses, and maybe something that might lead to a major. Then, after several semesters, they drop out because they aren’t getting anywhere. In order to make sure you’re getting somewhere, you need a graduation plan. This is a list of all of the courses you plan to take each semester in order to graduate. 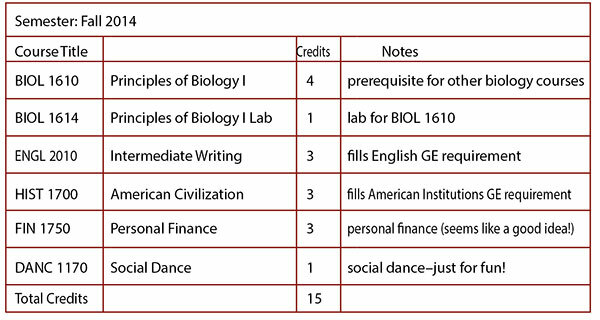 When you have this list, you are ready each semester to register for classes because you know what you need to take next. Your plan doesn’t have to be set in stone — you can rearrange it if you realize you’d like to take a different GE course or can’t get into a class you want. If you made the plan, you know where it is flexible and where it is not, and you won’t have to take an extra semester because you didn’t realize that one class has to be taken before another. 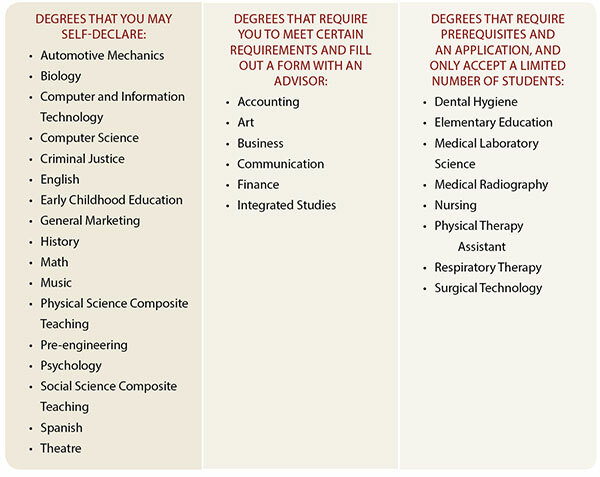 Decide what degree to pursue. Choose which semesters you will attend school and how many credits you will take each semester. Determine what courses you need to take. The first step in making a graduation plan is deciding what degree you’d like to pursue. This is not an easy decision for many students. For help with this decision, talk to the Academic Advisement Center, a program advisor, or the Career Center. Even if you aren’t sure you know what degree you’d like to pursue, you can still make a graduation plan. This is a good way to investigate a degree and see if it feels right for you. If you change your mind later, you can easily adjust and make a new plan because you know how to do it. If you are considering two different degrees, make a plan for both of them — this alone might help you decide which one to pursue, and it will show you how much wiggle room you have before you have to choose one or the other. An up-to-date list of degrees and certificate programs is available through the Catalog. If you are interested in getting a bachelor’s degree in a subject not offered at DSU, you can finish one to two years here, then transfer to another college or university. All courses over 1000 level transfer to other public institutions within the state of Utah and usually to other colleges and universities as well. You should begin checking into what credits transfer and what the degree requirements are at colleges you might want to go to — see the Academic Advisement Center for assistance. It is a good idea to get a Letter of GE Completion (31 credits) if you plan to attend a public institution in the state of Utah or an associate’s degree (60 credits) for any college or university before leaving DSU so that you will not need to take extra GE courses after you transfer. Once you’ve decided which degree you wish to pursue, you should declare your major officially with the university. Some certificates and degrees allow you to declare this major yourself by requesting it online or speaking with an advisor. Other degrees require that you fulfill prerequisites, meet certain requirements, fill out a form with an advisor, or apply and be admitted to the program before declaring this major. For these majors, follow the steps below and you will be listed as a pre-major (for example, if you declare nursing as your major, you will be listed as a pre-nursing major). Then contact the advisor for this program. Click here for a list of current advisors. 3. Under [Registration], click on [Registrar’s Office]. 4. Click on [Change Majors] at the left hand side, and fill out the form. To make a graduation plan, you need to decide which semesters you plan to attend school and approximately how many credits you plan to take each semester. This will determine how long it will take you to graduate. It is recommended that students take 15 credits each semester (or 30 credits each year) in order to graduate in 4 years. Most students take courses during fall and spring semesters. Summer terms can also be a good time to take care of a class or two, but only classes that many students want to take are usually offered in the summer. Summer courses are taught in about half as much time as fall and spring, so you should only try to take half as many credits during a summer term as you would during a fall or spring semester. Some courses are also available during the block in fall and spring — this means they start later but finish at the same time as other courses. If you have to drop a class part way through the semester, adding a block class can help you keep on track for graduation. Beware of the temptation to try to cram too many courses into each semester — remember that every line on your plan represents many hours of studying, taking exams, writing papers, reading textbooks, doing assignments, and so on. You should plan on two hours outside of class for every hour in class — for 15 credits, that’s 30 hours of studying every week! It is also important to take into account how many hours you plan to be working. Repeated research has shown that if you go to school full time, you should not work more than 20 hours or your grades will suffer. Learning requires time! You can’t expect to do well if you are trying to cram a day’s worth of studying into the few hours you have after work. To make your graduation plan, write out a list of the courses you will take in your major for each semester or term, keeping track of the total credit hours for each semester. Start with any credits you may already have, then list the courses you are taking this semester. Then start planning for the future by writing in the courses you will need to take for your major, GE, and personal interest. You can use a sample graduation plan from the University Catalog as a starting point. Your plan will include a list like the following for each semester until you have everything you need to graduate. • Your plan will need some flexibility. The semesters when each course is taught can change from year to year. Also, a course that you wanted may be full or conflict with the time of another course. Make notes to yourself of which courses can be changed and which are important to take at a certain time. • If possible, try to space out your GE courses. Taking all courses in your major can be exhausting, especially at the end of your degree, when courses may be more difficult. If you can, try to take one class that sounds interesting or exciting each term. However, don’t leave any critical GE requirements until your last semester. • Note that not all courses are available in every semester or term. Upper division courses (those with numbers over 3000) are often taught only in fall semesters, only in spring semesters, or only in odd or even numbered years. Once you have a plan, it is a good idea to go over it with an advisor —otherwise you may waste time and money on courses you don’t need or have to take extra semesters because of an important detail that you missed. It is particularly important if you are planning to apply for a program or an AAS degree, as there are deadlines that you may not be aware of. If you are planning on earning an associate’s degree or a certificate, check with an advisor in the Academic Advisement Center. If you are planning on pursuing a bachelor’s degree offered at DSU, there are program advisors for each major — check the Advisement Center website under [My Advisor] to get the name and contact information for the advisor in the area you are interested in or see pages 39-40 in this book. If you are planning to transfer to another institution and pursue a degree that isn’t offered at DSU, seek out a professor as well as an advisor in the Advisement Center in the area you want to study to discuss your plan with. You should review your graduation plan each year. 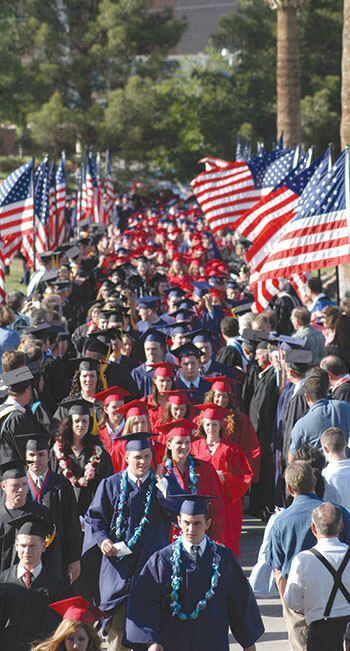 Students who maintain continuous enrollment at Dixie State University have the right to apply for graduation under the general education and degree requirements listed in the catalog under which they first enrolled as a matriculated student. Continuous enrollment is defined as successful completion of at least one credit-bearing course each academic year. Catalog rights extend for four years for an associate’s degree and seven years for a bachelor’s degree from the date of matriculation into any DSU degree program. A student may choose to forfeit catalog rights and apply for graduation under the requirements listed in the catalog for the semester in which they will graduate. A student must fulfill all requirements (graduation, degree, general education, and program) from one catalog. See Academic Policies and Procedures in the University Catalog for more information.